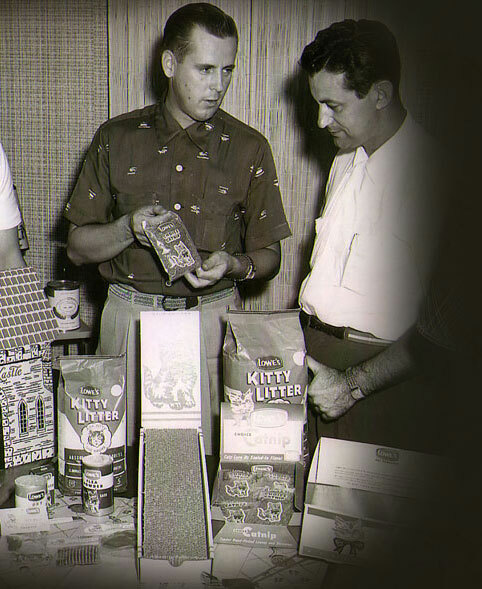 Kitty Litter’s popularity increased in the 1950s, and in 1955 cat owners spent $1.5 million for the cat box filler and other Lowe & Lowe products. To meet growing demand, Ed began to increase manufacturing efficiencies. In 1951 he moved his packaging operation from southwest Michigan to a facility in Paris, Tenn., to be closer to the Southern Clay Co., which provided raw material to his company. In 1958 Ed purchased a manufacturing facility and mining tract in Olmsted, Ill. This was a big milestone that enabled him to engage in vertical integration of mining, process and packaging. 12/1952 — Life magazine mentions Kitty Litter in an article about the largest cat show in the country held in Los Angeles during National Cat Week. 10/1/1953 — Ed forms a new company, Happy Day Products Inc., to overcome pricing problems and profit demands between the pet store market and the grocery industry. A few months later, Happy Day Products introduces Tidy Cat to sell in supermarkets. 1/27/1954 — Kitty Litter ads appear in numerous magazines, including Better Homes and Gardens, Cats, American Family, Sunset, American Home, McCall’s, House Beautiful, Ebony, Modern Romances and Parents’. 7/28/1954 — Ed changes the name of his company from Lowe & Lowe to Lowe’s Inc. The new entity handles all pet items, including its flagship product, Kitty Litter. Offices are established in a house at the southwest corner of York and O’Keefe streets in Cassopolis, Mich.
3/5/1958 — Lowe’s Inc. investigates the use of additives such as sassafras bark and oil, to control odor in Kitty Litter.